You’ll notice its commanding presence first. Rising above the the Tipperary landscape, the Rock of Cashel was the traditional seat of the kings of Munster for several hundred years. 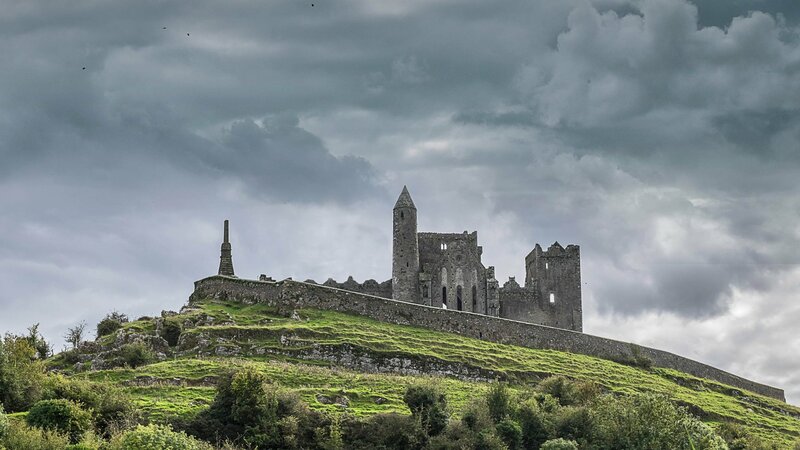 Dating to the 12th century, the Rock of Cashel is associated with various prominent Irish historical figures. Saint Patrick is said to have converted the pagan King of Munster to Christianity here. Brian Boru was crowned High King of Ireland here. 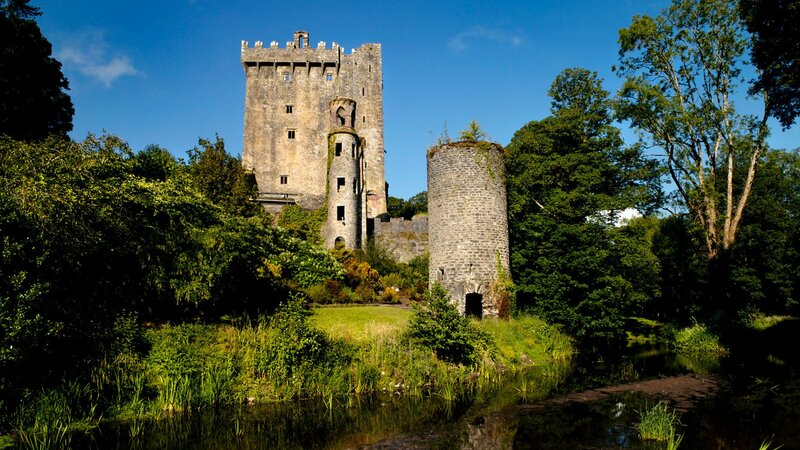 But there’s so much more to the famous Blarney Castle. Constructed in 1210, it would be rebuilt in 1446 due to a terrible fire. Originally owned by the MacCarthy clan, it was confiscated by the Williamites in the 1690’s. A stroll around the lush landscaped gardens that surround Blarney Castle are a real highlight on our tours. 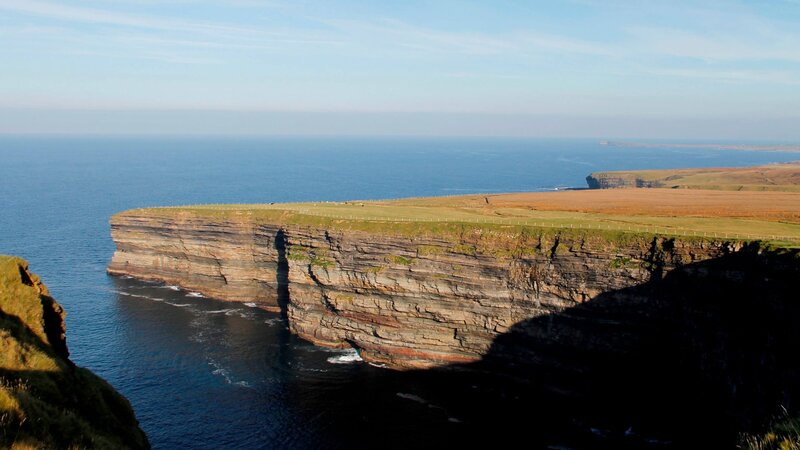 Located 12km/7 miles off Ireland’s Atlantic coastline, monks established a monastery in this wild location between the 6th-8th century. As a monastery it remained continuously occupied until the 12th or 13th century. It remained a place of pilgrimage afterwards. Feeling energetic? 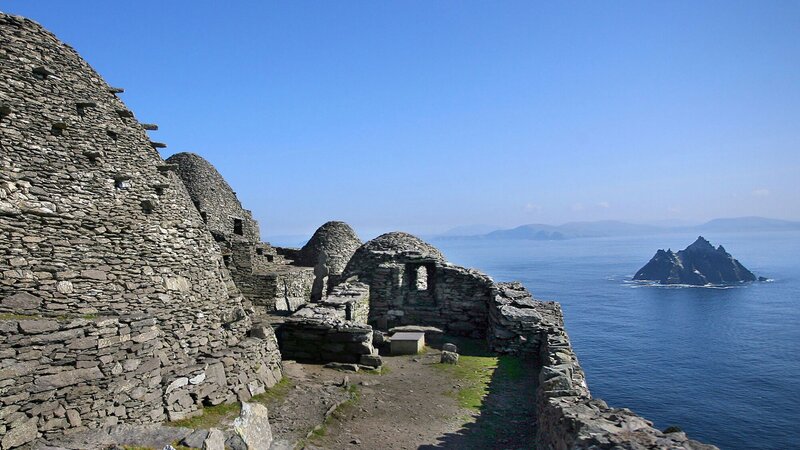 Our 12 Day Vagabond Giant Irish Adventure Tour gives you the opportunity to land on Skellig Michael. After a rough, 60 minute ocean crossing, you’ll need the stamina to climb over 600 steep, stone steps to Skellig Michael’s summit. You can then explore the stone beehive huts where monks lived and prayed. 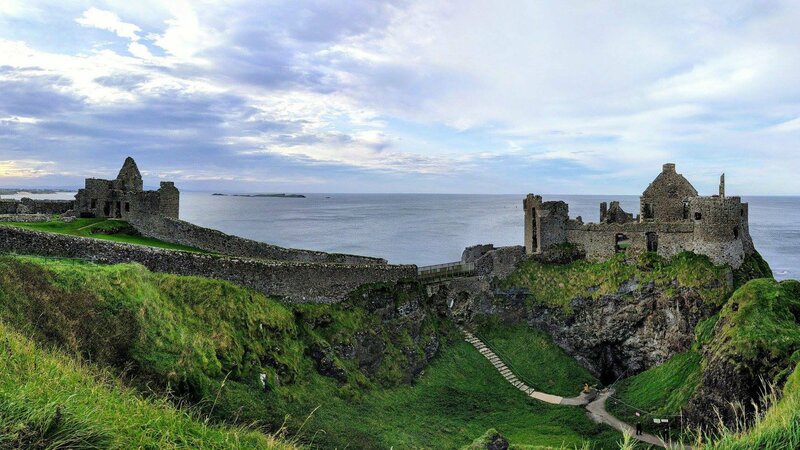 Strikingly situated atop sea cliffs in Antrim, Dunluce Castle has born witness to a long and tumultuous history. First built by the Earls of Ulster, this 13th century fortress is also associated with the famous warrior chieftain, Sorley Boy MacDonnell. The castle was reputedly an inspiration for C.S. Lewis’ Chronicles of Narnia fantasy series. Game of Thrones might like to imagine Theon Greyjoy alighting from a ship here – Dunluce served as Pyke in the hit TV series. 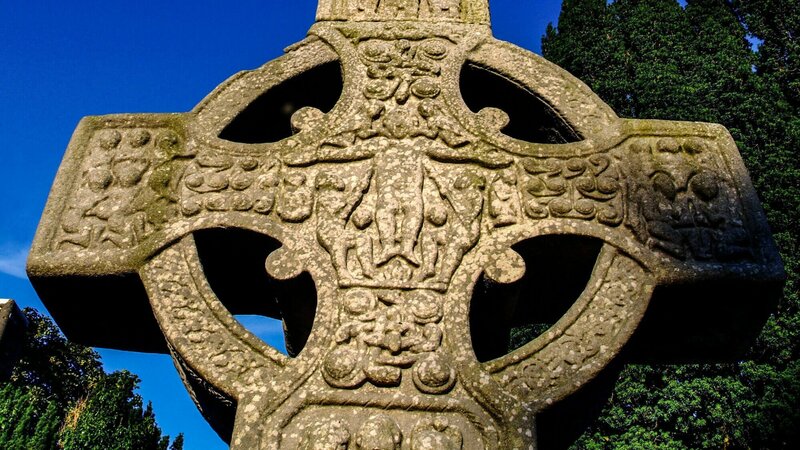 Monasterboice was founded in 520AD by St Buithe, a follower of St Patrick. 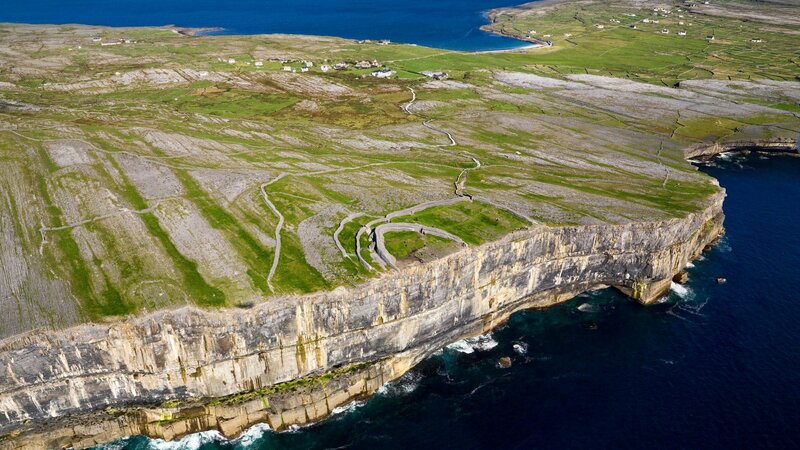 It’s a prime example of early Christian settlements in Ireland. The impressive Celtic High Crosses here are Ireland’s tallest. Constructed at the same time that Irish Celtic society was embracing Christianity, the crosses are distinguised by a unique decorative style. Celtic crosses were used as teaching aids for a largely illiterate and pagan population. People would gather at the high cross to listen a monk interpret biblical scenes. The Céide Fields are the world’s oldest known field farming system. Over 5,500 years old, they’re approximately twice as old as the pyramids! And that’s not all… The Céide Fields are also the most extensive neolithic (Stone Age) site on Earth. 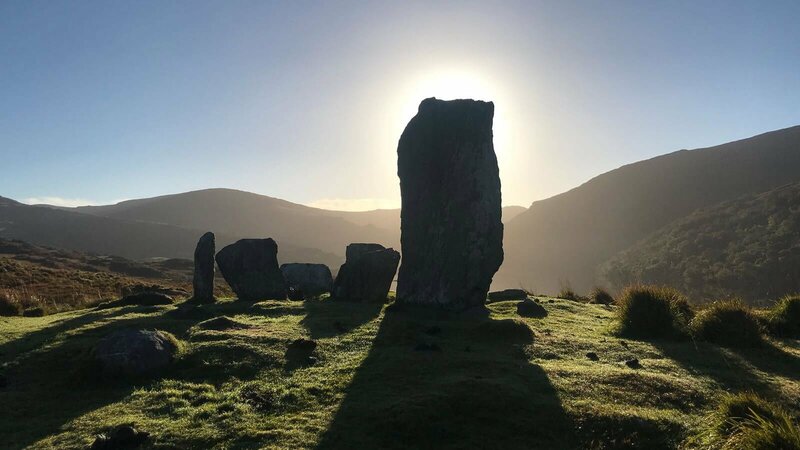 Located in the spectacular wilderness of North Mayo, you can visit this archaeological wonder on our 7 Day Vagabond Magnetic North Adventure Tour. While we’re on the topic of old age, one of the most ancient historical places in Ireland is the Poulnabrone Dolmen. Like the Céide Fields, this portal dolmen dates back to the neolithic Stone Age period (somewhere between 4200 and 2900 BC). 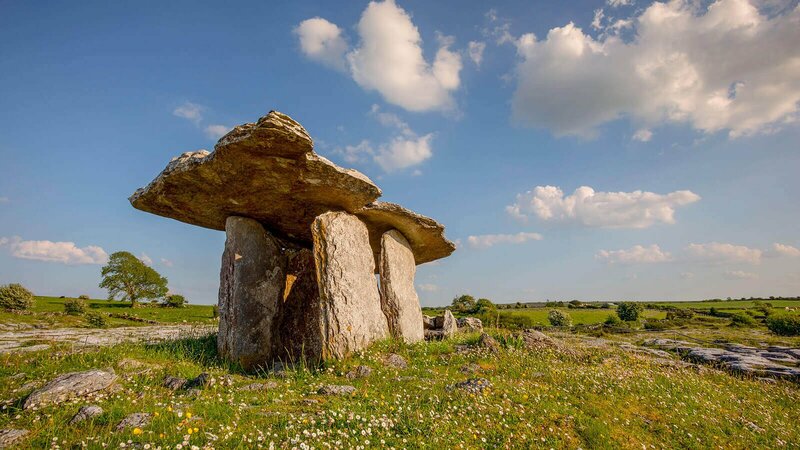 Located in the stunning Burren region in Clare, the Poulnabrone Dolmen was was found to contain human remains as well as weapons and jewellery. Archaeologists speculate that the portal dolmen was used for unknown ceremonial and ritual purposes. No one knows exactly what the Uragh Stone Circle’s purpose was. So when we visit, we like to let our imaginations run wild! Surrounded on either side by spectacular mountains, waterfalls and lakes, the natural setting for Uragh is truly jaw-dropping. Located on the rugged and undiscovered Beara Peninsula, Uragh consists of 5 standing stones, arranged in a circle. These are dominated in turn by an enormous monolith. Also dating from the neolithic Stone Age era, Uragh is DEFINITELY one of the most amazing historical places in Ireland. You have to go to the very tip of the country’s westernmost point to find one of the most incredible historical places in Ireland. Perched on the very edge of 100 metre high cliffs, facing the Atlantic, lies the fort of Dún Aonghasa (Fort of Aengus, in Irish/Gaelic). Constructed in 1100BC, little is known of the original structure’s purpose or owners. Besides providing defense, it is thought that Dún Aonghasa may also have served a ceremonial role. One of the most wonderfully located historical places in Ireland, Kylemore Abby is nestled between two mountains and a lake in beautiful Connemara. Tissues at the ready! The tale of Kylemore Abbey is romantic and tragic in equal measure. After wealthy English couple Mitchell and Margaret Henry became enchanted by Connemara on their honeymoon, they endeavoured to build a home there. Unfortunately, Margaret died not long after construction of Kylemore was completed in the 1860s. A chapel situated on the beautifully landscaped gardens pays tribute to her. 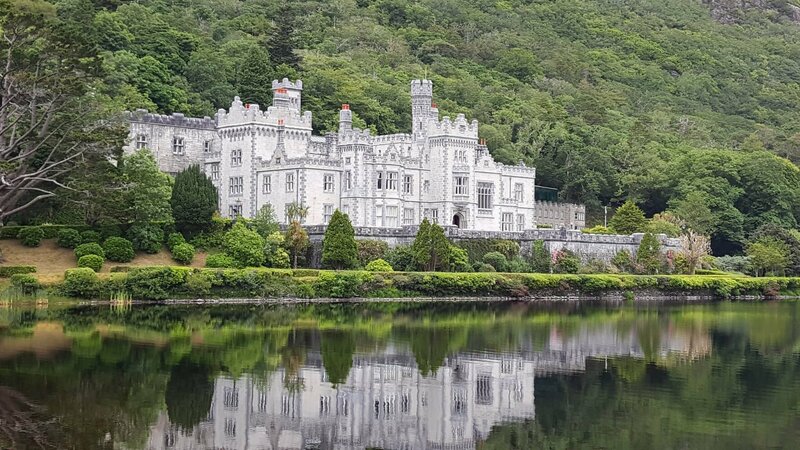 Visit Kylemore Abbey, as well as many other historical places in Ireland, on our 11 Day Driftwood Discover Ireland Tour.